Many people believe that it is worth investing in experiences rather than in material things. If you have already experienced swimming with dolphins, then you probably agree with this. However, it is so much better to live this experience in a completely natural environment. Do you want to live an experience with nature? Then you will find this list of places very interesting. Something we think that you may like about the recommendations we have for you today, is that all the habitats are in Cancun, which means you could experience swimming with dolphins in more than one of them. You read that correctly: the biggest aquarium in the world is in Mexico and it’s a very unique ecological park: Xel-há. Here you can be in very close contact with these incredible mammals through a swimming with dolphins experience. Besides, this location has the great advantage of being 20 minutes away from the Tulum archaeological zone. Enjoy this experience in an incredible natural habitat! Where else can you enjoy the fine white sand of the Mexican Caribbean and the peaceful sea, only in the Riviera Maya. 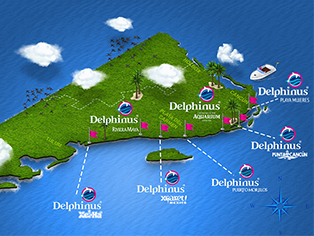 Here, you will not only live a swimming with dolphins experience, you also can be a witness of the Delphinus Animal Welfare Program. This program involves investigations of marine mammals and is supported by the best dolphin veterinarians and marine biologists who dedicate their lives to ensuring the health and welfare of every specimen in this habitat. We have already mentioned this port in previous blog posts, a port where you can rest and have a relaxing holiday, we’re talking about Puerto Morelos. You can go for an evening walk along the Puerto Morelos bay and you can also experience swimming with dolphins with those you love the most. Don’t forget that this is the second biggest reef in the world. This habitat, located in the Mexican Caribbean, differentiates itself from others because you can learn more about environmental education and interact with dolphins in the sea. With these 3 natural habitat options, it seems impossible not to consider swimming with dolphins in a natural environment in the Mexican Caribbean. Choose the one that adapts to your vacation plans, book in advance and interact with this unique ocean mammal.